Z Gallerie announced today a live event on Sunday, February 28th celebrating Red Carpet style and its relationship to glamorous home decor in partnership with noted San Francisco-based fashion illustrator, Andrea Michelle Simons. 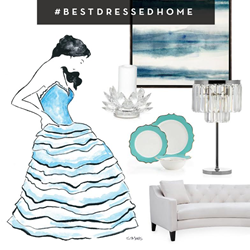 During the arrivals coverage, Andrea will illustrate five of the Z Gallerie design team's favorite gowns to pair with Z Gallerie’s spring product collections. The fashion illustrations will be shared on Instagram and Twitter in real-time along with their home decor counterparts. Drawing figures since childhood, Andrea continues to develop her love for fashion illustration while being inspired by the evolution of fashion and the beauty in life’s poses. Headquartered in Los Angeles, Z Gallerie is a fashion forward lifestyle brand focused on the home. Since 1979, the brand has inspired interior decorators and stylish influencers with cutting edge design and sophisticated, accessible furnishings. Each season, Z Gallerie offers the latest ideas in furniture, art, home decor and entertaining tailored to each individual's personal style aesthetic. A catalog, a full online presence at zgallerie.com and 60 stores nationwide keep the iconic Z Gallerie name in the fashion home space.